Malcolm X’s Chicago house had been firebombed that morning. Both Malcolm and Dr. Martin Luther King were in New York for speaking engagements. Malcolm had requested a secret meeting with Dr. King. King had agreed. 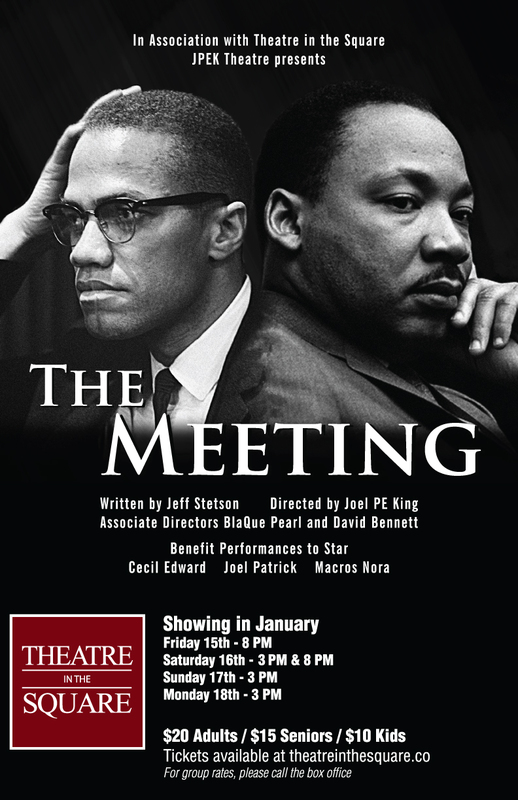 It is a fictional account by Jeff Stetson entitled “The Meeting.” In this play Stetson speculates what these two influential yet very different civil rights leaders would have talked about had they met. In the drama, they both want the same thing: better lives and more opportunities for people of color in America. They both operate out of many of the same assumptions, and they are both deeply religious. Malcolm faults King’s approach of nonviolence and suffering love. He accuses King of exposing his own people, including children and women, to beatings and abuse — making them victims of a racist system. He argues that King plays into the hands of the racists and segregationists. As Malcolm made his case, I found myself siding with him. A part of me wanted to meet force with force and give the oppressors what they deserved. King repeatedly makes the same defense to Malcolm. Suffering love is redemptive and transformative. This conviction is King’s only defense of his methodology of non-retaliation. At the end of the conversation, King gives Malcolm a doll King’s daughter gave King to give to Malcolm. The doll is to replace the doll that Malcolm’s daughter lost in the fire. Nonetheless, at the end of the encounter, their disagreement is unresolved. King is distinctively Christian. As I watched the play and found Malcolm’s argument resonating with me, I realized how difficult it is to be Christian. King and his organization trained and drilled their people not to retaliate in the face of degradation and brutality. They conditioned them to resist their human tendency--that of all of us--to strike back. At this point we might expect an armored lion fuming at the nostrils, but instead we are introduced to a lamb, looking as if it has been slain (vs. 6). This is not just any lamb: this is the diminutive form of the noun; a young lamb, vulnerable and unprotected. As the passage continues, we learn that, indeed, this lamb was slain (v.9). The verb here is the perfect form, meaning that the lamb continues, in a way, to be slain. The lamb still bears evidence of the violence done to it. The lamb, of course, is Jesus. There is something in his being wounded on behalf of others that makes him worthy to open the scroll and inaugurate God’s future. Only a love that is willing to suffer can open to us and creation a future worth living. Dr. King believed that suffering love is redemptive. He called his followers to live by that conviction. He was, in reality, simply calling all of us to be Christian. It is not easy being Christian. As we remember his legacy this Monday, he challenges us to continue to work at difficult things.